In our house we bake these Irish brown soda scones on Christmas Eve because we drape them with smoked salmon on Christmas Day. I know, I know the season has been and gone but there is no reason why I shouldn’t enjoy these easy nifty scones all year around. The beauty of this recipe is that it makes 8 mini scones. For our family this fills the lunchboxes 1 day a week but if you’ve a small family then you can freeze these scones with ease for up to 2 months. 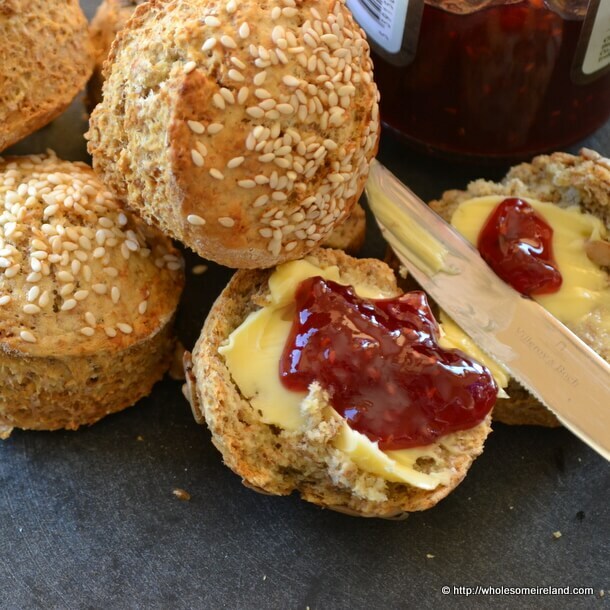 Mini scones are also perfect for Afternoon Tea trolleys and light snacks. Today I’ve slathered the scones with some local raspberry jam for a sweet hit but in truth there is nothing sweet about Irish brown soda scones, they are savoury unless you add something else on top. In a large bowl, mix the flour, baking soda & butter until you get small breadcrumbs. Pour in the buttermilk and loosely mix until it all comes together in a dough. If it’s a little dry add a small amount of water. Once you have a loose dough, turn it out onto a floured board and using the palm of your hand push the dough until it is about 1.5cm thick all the way around. Using a small cookie cutter or scone cutter, cut out the scones and put directly onto the lined baking tray. Brush the top of the scones with extra buttermilk and sprinkle with seeds of your choice. Bake for approximately 15 – 20 minutes. They should be golden brown and the seeds should have changed colour too. Remove from the baking tray and allow to cool slightly on the rack before serving. These scones can be frozen once cooled for up to 2 months, or are best eaten on the day they are baked as they contain very little salt. This makes them ideal for baby lead weaning. This brought me right back down memory lane C, just how I used to have them when I was younger and still love them now 🙂 I love how food can do that. Ah thanks Laoise. I know some people make them with sugar and eggs but honestly they don’t need them. The butter just gives them a little extra edge I think but you can leave that out too. I’m such a softy for family recipes. I think every family in Ireland has a recipe that’s a riff on this! Cheese is lovely in them & a herb butter makes them lovely & savoury. Definitely leaving it out is false economy. I have never added eggs to a proper soda recipe. You’re right it makes them too tight. Thank you for the recipe! I will bake some for tea tomorrow. We just made these this morning, I didn’t have strong white, just plain, would that explain why they didn’t rise much? They were also a tad dry, but perfect with a good bit of butter and jam. saw them first on the indo website, and was amazed at the low cost per scone, but wondering about the cost of heating the oven to 200 and baking for 15 minutes! Hi Irmhild – The cost of running an oven for 15 minutes can be calculated on the Electric Ireland appliance calculator. For example, using an electric oven for 10 hours per week costs approximately €8 per week, or 80c per hour (or 40c for 30 minutes to allow for heating and maintaining the oven at 200 degrees). If you found them a little bit dry, add 20g more of butter the next time, I’m afraid I’m not sure why they didn’t rise – assuming you used bicarbonate of soda (bread soda) and real buttermilk in the recipe (as opposed to soured milk), mine always do, but yes do try with strong white flour and that could be the missing component.